People behave the way they do because of two underlying factors. Beliefs can also build during the formative years as well. They are deconstructed and reconstructed as we go through life, however. It would be very difficult for me to change a deep seeded value without impacting you greatly, however I could present you with some facts and figures that may change your belief relatively quickly. Beliefs are more on the surface as compared to values, however they can also be so deeply held that they have as strong an impact on our life as a value. We want to focus on beliefs, because as Business Owners, this is the area we can affect more readily with ourselves and our employees. 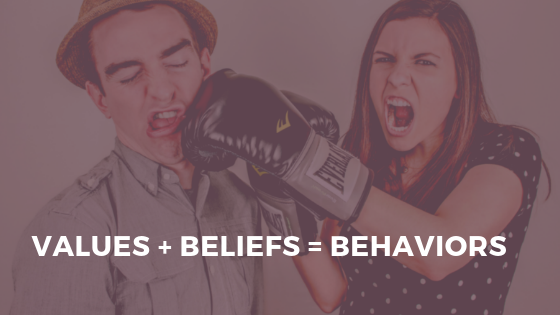 If you want to change the behaviors of an employee, or even yourself, work on their beliefs. Attempting to change their values is a long uphill battle that may never happen. However, beliefs can be impacted more readily. In the podcast I shared my story of overriding a deep seeded value with a belief. I still do it to this day. My value has never changed in this area, however I do have a strong belief that keeps me in line. Listen to the podcast to hear this simple yet strong example of how you can address someones incorrect behavior by impacting their beliefs. So how do you do this for an employee or yourself? It's actually fairly simple. They key is to stay consistent in your approach and follow through. For an employee, you need to explain to them the behavior that does not align with your companies values or mission and what needs to change. Providing a consequence that will result from this continuing behavior will likely impress on them, through their belief structure, that they need to act differently. They need to believe they need to make the change. The process works the same way with yourself. As you catch yourself having limiting beliefs, you must destroy those beliefs and create new ones. It could be that you have inappropriate beliefs about money, work, your ability or the like. When you have limiting beliefs, it keeps you from being as successful in your business and life as you could be. These incorrect beliefs subconsciously impact you and even lead you to sabotage your success. We suggest joining a mastermind or hire a coach to help get you on the path to proper beliefs. It is one of the greatest breakthroughs you will likely make for your business and your life. So many things can be changed by just simply changing the thoughts we have between our ears on a daily basis. It is something each and every one of us must intentionally work on. If you are interested in a Mastermind for Business Owners, go to www.BusinessOwnerFreedom.com and apply. We also mentioned in the podcast a great book about limiting beliefs, The Big Leap. It is one I read at least once a year and recommend regularly.